For wedding guests struggling to find a present that is unique, personal and stands the test of time – why not give the wedding gift of art! Original artwork is the perfect way to say congratulations to a newly married couple. It’s a unique gift that stands the test of time, that can be carried with them though their new life together, symbolising and commemorating their bond. Whilst they may forget who gave them the bread maker or the towel set, a piece of art is a memorable present which can bring joy and beauty into their home every single day. WANT TO GIVE A WEDDING GIFT THAT’S EXTRA SPECIAL? With the wedding season upon us, the challenge is to find an extra special wedding gift. Look no further than the NEW personalised gifting brand, Vanilla Reindeer, who offer a range of gift bags, bottle boxes and bags (and cards) which are ideal for personalising with a photo and special message for the happy couple. Prices range from *£6.99 – *£8.99 for the gift bags so something 100% unique doesn’t have to cost the earth. Read more about WANT TO GIVE A WEDDING GIFT THAT’S EXTRA SPECIAL? 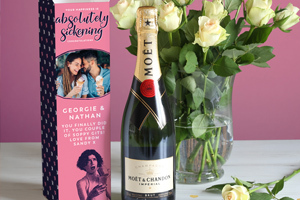 The Wedding Shop, the UK’s largest independent gift list service, have undertaken research into the world of wedding presents to find out what couples really want, what guests are willing to give and how to avoid the modern-day pitfalls and difficulties which can accompany wedding gifting to ensure the happy couple have everything they need for their newly-wedded life. The results are clear - despite some of the more traditional marriage celebration conventions changing, couples in the UK still want to be spoilt on their big day and have simply become much more savvy in selecting gifts. Choosing a wedding gift that both newlyweds are going to enjoy can be quite the task, especially for those who haven’t created a gift list to lend a helping hand. The One4all Gift Card is a great choice, allowing the happy couple to pick out something they really need or want as they embark on married life. Newlyweds may want to use their wedding gift card to plan the perfect honeymoon and with a variety of travel providers available, including Kuoni, Thomas Cook and TUI, One4all makes it easy to organise a romantic trip away and have a peaceful start to marital bliss. Summer is officially upon us, and with that comes wedding season. Alongside the planning and anticipation that goes into a loved one’s special day, there also comes one big worry — what to buy them?! If you have a summer wedding coming up and are struggling for gift ideas, we’ve got your back. Whether they’re the traditional type or favour a more quirky style, we’ve put together a selection of bride and groom gift ideas that are sure to make their big day just that little more special! The Ultimate Wedding Day with IL GUSTO! With the wedding season upon us, it's an exciting time and the wedding planning process should be as smooth and flawless as possible. With that being said, Il Gusto (www.ilgusto.com) has a wide range of beautiful wedding favours to offer wedding guests. Your wedding favours are a way of saying thank you to your guests; a small token of your appreciation for them sharing in your special day – so why not make them as special and unique as possible! With everything from miniature bottles, starting from £2 in a variety of beautiful shapes filled with a range of premium spirits, such as liqueurs, gin and vodka to half bottles of sparkling wine swirled with edible gold leaf – wow your guests with the range. Read more about The Ultimate Wedding Day with IL GUSTO! Wedding guests faced with the dilemma of what to gift the happy couple have a new, unique, and heartfelt option to choose from. The experts at Recordalife have launched a new edition of their love themed product that will help the newlyweds to share their personal love story. Whatever happened to sentimental keepsakes? Half-heartedly ‘Liking’ a picture on Facebook just isn’t the same as getting a copy of said photo and putting it in a frame, is it? Flicking through a gallery on social media doesn’t compare to sitting shoulder to shoulder, flicking through the photos you’ve just picked up from Supasnaps, laughing at the memories you froze in time. The ultimate personalised wedding gifts were thoughtful albums, stuffed with special photos and keepsakes from the big day. Read more about Whatever happened to sentimental keepsakes? The upcoming wedding of Prince Harry and Meghan Markle has sent the nation into a wedding frenzy. With wedding season kicking of this month, guests across the country will be asking themselves the same questions: how much should I spend on a wedding gift and is it okay to give cash?! Research* from personal loan provider, Hitachi Personal Finance, has got to the bottom of just how much the nation spends on (and expects to receive as) a wedding gift, and if cash/vouchers or a physical gift is better. Finding a wedding present that is as unique as the happy couple can be a difficult task. A set of bathroom towels, although useful, can seem a little impersonal and won’t necessarily last a lifetime… That’s why art makes such a wonderful wedding gift; it’s original, personal and will make any new house immediately feel like a home. Hello, thanks for stopping by to read this, I’m Jane Fox, based in Walton le Dale, Preston in Lancashire and I make gift shopping for personalised hand painted and handmade ceramic wedding gifts easy for you. By creating unique bespoke one off gifts for you to give to whoever you wish to. I hand paint your personalised design on to ceramic pottery items in colour, along with a name and a personalised message from you if you would like one. This saves you the frustration of trawling around the shops unable to find something unique and saving you precious time in your busy life for you to spend in a happier way. What can be better than a personalised gift created for you or a member of your family? Mochi from Ai No Mochi are an exciting and innovative alternative to your standard wedding favours. Mochi are set to be the next big trend in wedding favours! Choose from delicious flavours such as Raspberry and Coconut Ripple, Vanilla Cheesecake and even Vegan Chocolate Ganache. Each wedding tries to be better than the previous one and with all weddings having similar favours, mochi are something that most guests will never have seen or tasted before. The freshly made, bespoke, mochi are a big talking point with their unique exterior texture and creamy soft filling. They can also be colour customised and hand-decorated to tie in with the couple’s wedding theme. The UK’s oldest cheesemonger Paxton & Whitfield has a great collection of luxurious cheese wedding gifts, from hampers, unique cheese experiences to cheese serving accessories that all make fantastic Wedding and Civil Partnership gifts for couples who are food enthusiasts. Prezola is the UK’s leading independent wedding gift list service for couples who want the ultimate in choice and flexibility. Launched in 2010, our unique multi award-winning service lets couples have gorgeous gifts and experiences together with a commission-free honeymoon fund and charity donations on one easy-to-use list! The first of it's kind, you can create your very own tailor-made chocolate bar online, choosing from 70 quality (and grown up) ingredients and customising the wrapper with your own image & message. What better way to thank them for sharing your special day?